The alpine pass St Gotthard leads up to 2000 metres of height over the mountains. The Gotthard street runs from the canton of Uri to Ticino, Andermatt and Airolo are combined by the transition. The Teufelsbrücke (Devil’s Bridge) over the Schöllenschlucht (Schöllen Canyon) as well as the Surorow monument are the attraction of the route. 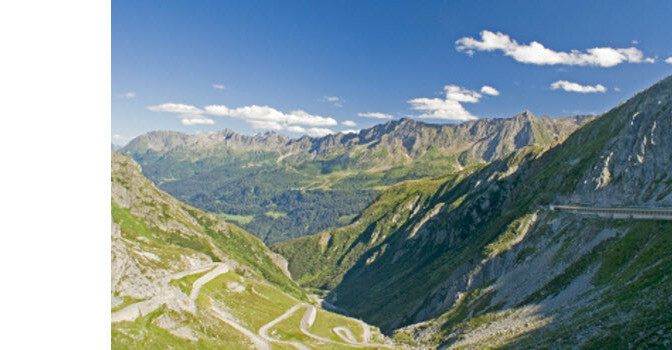 The pass street was established in the 19th century and is the most important way over the Alps from north to south. But even earlier – in the Middle Ages – traders came over the St. Gotthard. The 12th century Holy Gotthard’s chapel could be preserved until today. After fixation of the streets the stagecoach traffic over the St. Gotthard pass began. Soon the mountain was not only crossed over, but also passed through. Railways chug through the tunnel in the Gotthard massif. Nearly one decade later a parallel road tunnel was built. Since 1080 cars have been passing through the Gotthard tunnel. Everyone driving on the motorway A2 southwards will have to pass it. There are traffic jams predominantly during the holiday time. Contrary to the pass the Gotthard tunnel is open to car traffic throughout the year. In case the volume of traffic is gets to high, cars are only allowed to enter into the tunnel of 15 kilometres in small groups in order to avoid a standstill of traffic inside the tunnel. In 1872 the construction of the railway tunnel through the Gotthard massif began. Ten years later it was finally done: the Gotthard peak tunnel for the Gotthard rail was completed. To build the tunnel absorbed more time and money as originally planned from the builders. Numerous geological problems impeded the realization; accidents reduced the number of workers. A monument for the victims of the tunnel construction was raised at the station of Airolo. A new tunnel gallery for railway traffic, the basic Gotthard tunnel is currently driven. The route through the Gotthard massif will amount to 57 kilometres. First trains are expected to pass as of 2016. The Wilhelm-Tell Express passes the Gotthard tunnel on its way into Ticino – without traffic jam. Who travels along the Gotthard massif and enjoys the Swiss landscape probably sits in a train of the Matterhorn Gotthard Bahn (MGB). The railway company travels on more than 140 km of the Swiss rail network in the cantons of Grisons and Uri. In collaboration with the “Rhätischen Bahn“ the Matterhon Gotthard Bahn is responsible for the operation of the Glacier Express. Amongst others its stations are Andermatt and Zermatt, the popular destination at the Matterhorn.